New X-wing and Armada Products! This damage deck holder is designed to work with both sleeved and unsleeved cards used with X-Wing Miniatures Game and Star Wars Armada by Fantasy Flight Games*. It comes unassembled but includes peel and stick adhesive parts so no glue required for assemble. These movement tools are great for moving in very close and replicate one movement on the maneuver tool in Star Wars - Armada by Fantasy Flight Games*. This set includes a 3 range one movements that represent one tick, 2 tick, and no tick on the maneuver tool. It's been a long road! Our laser cutter is finally close to being ours! Last month we made the final payment on the lease and now all that remains is to make a final buyout payment. We need your help to get there! So we decided to have a sale. Seems like a win-win for everyone! You save money and we raise the extra funds to make this last payment! Use the code agnes2016 at checkout to get 15% off your purchase. All fabric mat prices have already been adjusted for the sale as well! Thank you to all out customers for the support over the years. We have a lot of products in the pipeline and hope to get them out soon. Stay tuned for more announcements! So we have been digging into Armada lately and have a a full compliment of accessories to release for it. A few make game play easier and a few are direct replacements for cardboard components. First up is the range rulers. These range rulers replace the cardboard one and come with a set of acrylic number tokens that fit inside the maneuver tool. Available in 3 fluorescent colors. This set replaces the other side of the ruler and comes with a 1 range ruler to measure engagement in those tight spaces. We did some serious thinking and came up with a great way to replace the fighter activation sliders. They look great in the fluorescent colors and will last a long time. Next up we have acrylic replacements for the command dials. These fit into the stackable plastic cases just like the cardboard. They look great when you customize them by filling the etches with paint or even a crayon! Armada's Objective system is a great way to add to the game play but who wants to mark mines with boring cardboard tokens. So we have an acrylic set to replace all of them. We also worked up some shield dials that drop right into the bases and use the same connectors as the cardboard ones. Again coloring them in with a crayon really helps the visibility. We also figured it would be nice to have some organization to those ship cards. So we created a dial with integrated slots for the defence tokens. We are using a new dial system that will lay flat. They are super easy to assemble as the dial is already attached and all you have to do it peal and stick the token frame onto the dial. They are sized to the same height as the Armada ship cards. So Armada is great but those little fighters are always getting in the way. So we came up with another location set like we did for X-wing. This one is a bit more complex and include tokens to keep track of the ships as well as the fighters. The ship location markers slip right into the back or front of the base. Next we have several tokens to replace the various command tokens. We know a lot of people have been asking for a turn dial as well. So we made as simple one to keep track of the turns. So that dial was a bit too simple for us. We went a bit crazy and this came out. This is our Deluxe Turn Dial. 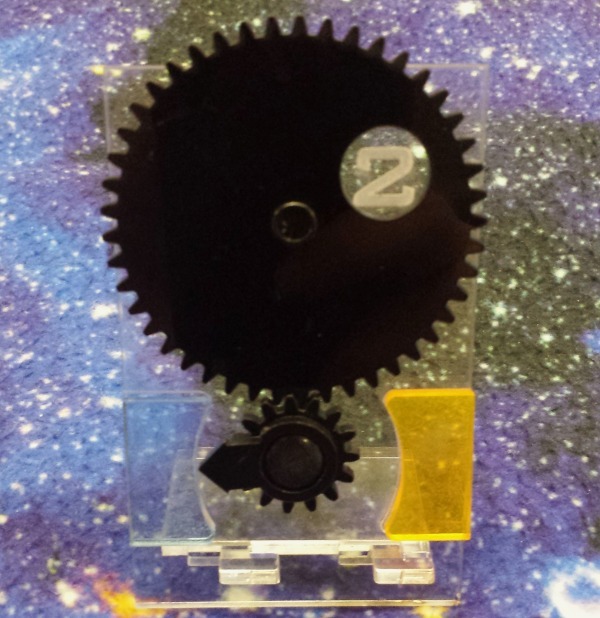 It' rotates to indicate all 6 turns and the gears move each other so it flips back and forth between orange and blue activate on every other turn. Oh and it comes with a removable stand! We will continue to watch Armada very carefully and see what else needs to be upgraded or helped along but we have a great start! We have a brand new token set in the store. This one is designed to work with Shadowrun: Crossfire. It is sold as a complete set or as individual items. It is also available in individual packs for those who only want part of the set or to expand it. This set comes with 20 x 1 yen coins and 5 x 5 yen coins. Great for other games as well! This set include 4 Damage indicators with card base. Quickly and accurately mark which slot is currently active on objective cards without fear of bumping. We have a new terrain item for the store. This Japanese style bridge is a combination of MDF, Acrylic rod, and styrene to create a unique look that works with most time periods and genres. Get adventurous and add LEDs to make a futuristic bridge with light up railing or use it as it is for everything from WWII to steampunk! New X-wing Products: Cloak Tokens, Huge Ship Movement, and New Colors! We have several new items for X-wing. First up is our new Cloak Tokens. 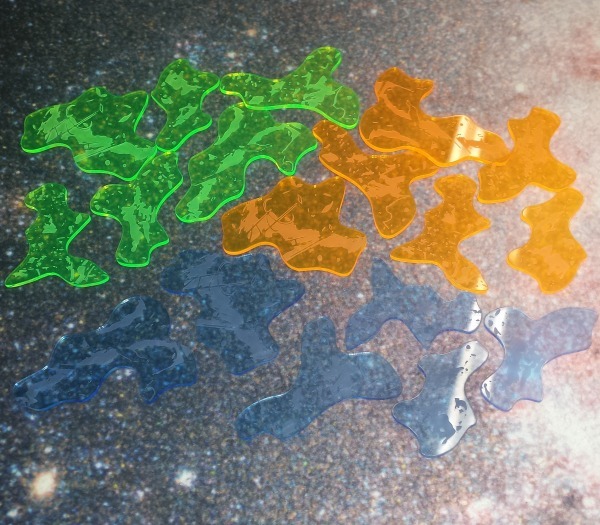 These tokens show a ship in transition among a star field. 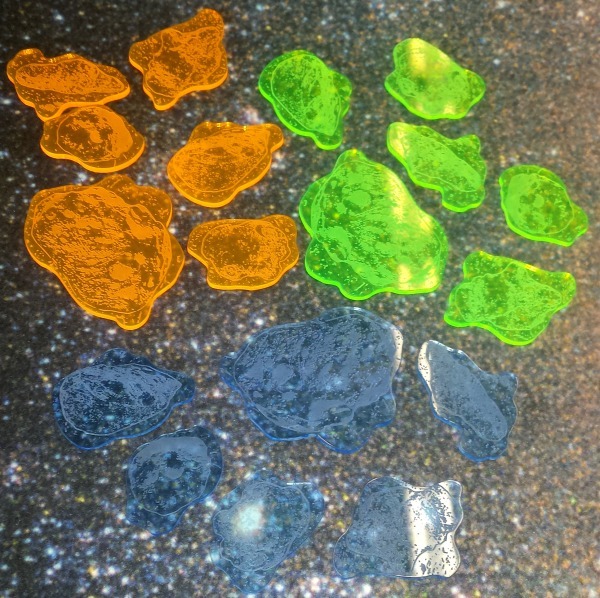 They are cut from fluorescent blue acrylic. Next up is our Huge Ship Movement Template. This should help you move those corvettes down the table in style. They come in Fluorescent blue, green, orange, and transparent red colors. 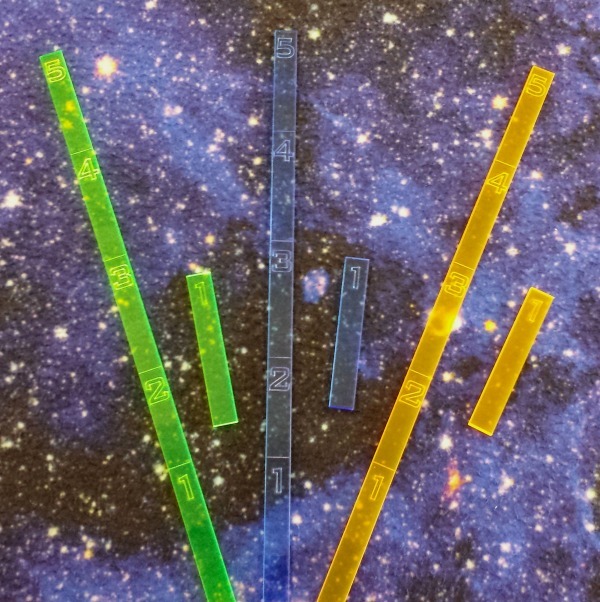 We also have new colors for our range rulers, firing arcs, and movement template sets. The new colors are Fluorescent Blue and Orange. These look great and give you some variety. We have some new templates and tokens. These are designed to work with Warmachine/Hordes but they may have others uses as well. First up are the Unit Health Tokens. These tokens allow you to track which units have taken damage and require more then a single damage to kill. They use a row system so they work with different size units without any extra bookkeeping. The 50mm base token has the most boxes and has 3 rows. 5 boxes labeled 5 and 3 boxes labeled 8 and 2 final boxes label 10. This allows you and your opponent to easily identify when a unit has reached it's damage limit. The next item is a set of movement templates that cover the most common movement used in the game. They feature 0.5", 1", 2" 3", 4", 5", and 6". Finally we have some blast keys. These templates are designed to illustrate 3", 4", and 5" AOEs from 30mm, 40mm, and 50mm bases. They also have a quick reference for the scatter diagram on them. We have some new 28mm landing craft in the store. Now you have a few more options for getting those troops onto the beach. First up is the LCA. This British landing craft were designed with comfy seats for the troops to ride in. To facilitate wargaming figures we increased the depth of the kit to hold standing figures in a tight formation. This allows figures to stand up under the side covers of the landing craft. Next up is the LCM. This craft was primarily used to move tanks and larger groups of troops to the battlefield. We have widened it slightly to accommodate 48th and 56th scale shermans and other tanks. It also fits walkers and other vehicles from Dust Tactics. We have a new laser cut kit for you guys. This 28mm scale landing craft should be great for getting all your marines onto those Pacific islands or storming the beaches of Normandy. We built it to hold 11 figures on 25mm bases or 6-7 on 30mm round lipped bases. You could also cram many more models in if you don't use bases. We have a new mat pattern that fills a void in our line up. It's a scale-less ground combat mat. It features a natural bland of greens and browns that will be great for any scale from 6mm to 28mm. It is available with hex or square overlays. 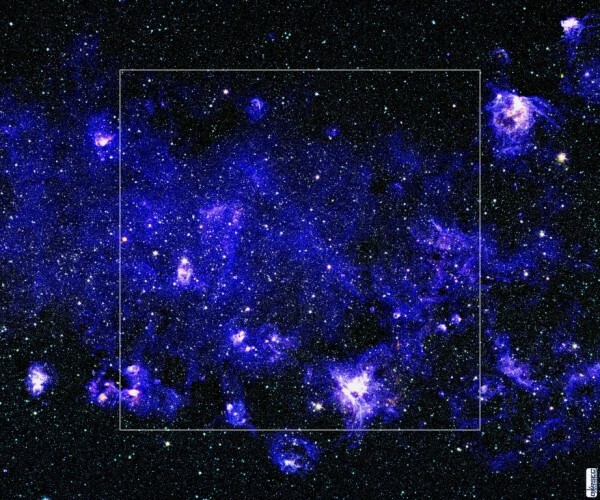 Price: $69.99 - 60" by 50"
$79.99 - 80" by 60"
We have also added a new listing for Starfighter Overlays. 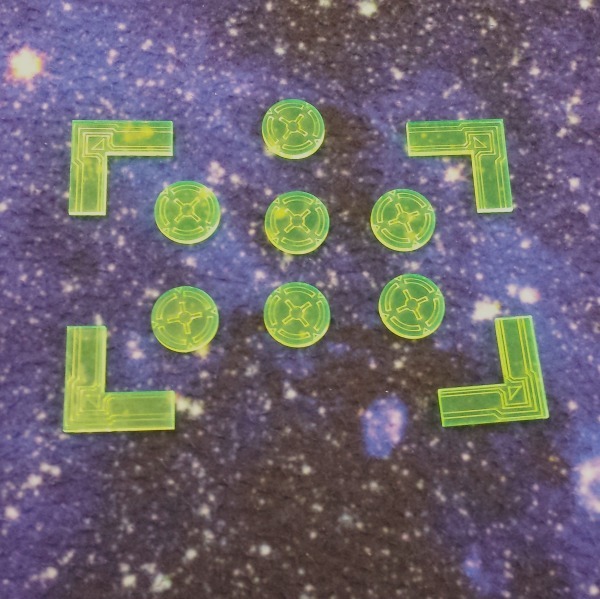 These mats feature a 36" by 36" square in the middle for tournament play of both X-wing and Star Trek Attack Wing. It is faded slightly so that it blends into the background a bit. This gives you the option to use the entire mat for larger games or different rule sets. It is available for all our space mat patterns. The 80" by 60" option features 2 squares for running 2 games side by side. Works great for tournament play. New Products: Tokens for X-wing! We have some new tokens and we updated out universal dials for those X-wing fans out there. We have been working hard to get a great token set that will work for X-wing. First up is the Starfighter Action Token Set. These tokens are also available individually in packs of 5. We also have not forgotten the shield tokens. These are cut from blue fluorescent acrylic. For you Y-wing fans, We have also have some tokens for ioned ships. Lets not forget some Target Locks. These tokens are two parts and need to be glued together but the extra effort is worth it for a token that stands up and is easy to see from across the table. They are available with A-F or H-M labels. We did some out of the box thinking as well and developed a token set to take care of some action cards that have delayed affects or changes that span an entire turn. They are designed to designate the affects of the Marksmanship, R2-F2, Exposed and Swarm Tactics cards. We have also updated the starfighter dials to include movement options for Star Trek Attack Wing and the new Wave 3 Ships. We are working on adding more support for Star Trek Attack Wind in the next few weeks. We will also be adding an overlay option to our fabric mats in the next few days. More on that later. We have adapted the starfighter dial designs to be more universal and even added a few etched designs. Every design has an option for 0-9 or 1-12. We have 6 designs currently covering all the major nations from WWII as well as a casualty dial. There is also an option for a blank dial. Each dial is 40mm in diameter. We have launched a Kickstarter for our first set of 28mm Scifi terrain. We have some new products available that should be handy for the X-wing players. We are working on a full token set as well. Many people have asked about it and we are working on putting together a set that really works well with the game. Our goal isn't to copy the original set but to one up it. Those should be available in a few weeks. For now, We have some handy items to tide you over. These dials are universal. They contain all the possible movements available in the game. Each dial can be programmed to fit your custom ship designs or simply as a replacement for your worn out dials. All you need are a few crayons and your ready to go. Check out our tutorial on how to do it. They are made of laser cut acrylic and will last a lot longer then any of the cardboard dials. Tired of bumping your ships with movement templates when the dog fights get tight? These new tokens allow you to mark the location of the ship and remove it. We also added several numbered circles so you can mark which ship goes with each location. They are laser cut from the same fluorescent acrylic that our template sets are made of. We had added an large option to the firing templates. 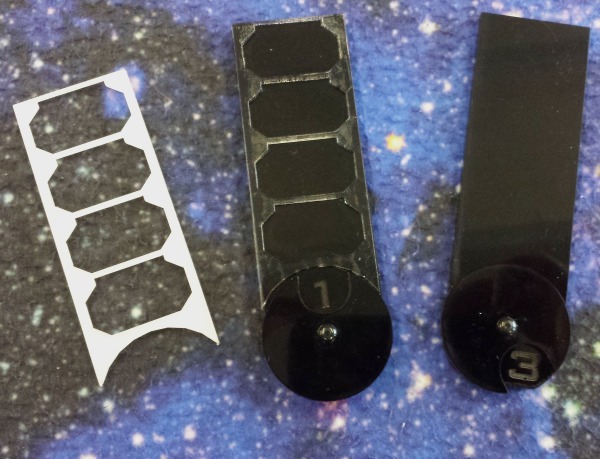 These are designed to match the nubs on the large starfighter bases and extend the arcs on the pilot cards. Great way to see if someone is in your arc or not. Available in Florescent Green and Transparent Red. We had a few requests for a token to keep tracked of pinned units. This set should have plenty of uses and offers a unique blood splat look. The material is 1/8" thick translucent red. It's not see through but it does have a softer semi-transparent look then is found with opaque red. We have been working hard on a lot of new cool stuff for you X-Wing players. We have several more product in the pipe but we didn't want to hold this one back. This template holder is great for keeping all those pesky templates in one place. It will work with any acrylic template set you happen to be using. We will not hold it against you if you don't have ours. It also works with the cardboard templates that come with the game. This should be handy for those of you playing in tournaments. As an added bonus, We decided to stick a damage deck holder on the side. It fits sleeved or unsleeved card decks. It does come unassembled. So keep that in mind. Super glue(CA) can cloud the acrylic so either be very careful or check out your local hobby store for some Proweld or another acrylic glue. You can also use foam safe CA glue. That will not cloud.